The Loveland terrain park is located on the trail called “Tempest”. This is on the north facing side of the mountain and this park is easily accessible from chair #1. This terrian park has a few small-medium jumps and several rails and slide boxes. There is also a large wall-ride that you can see in the photo to the right. 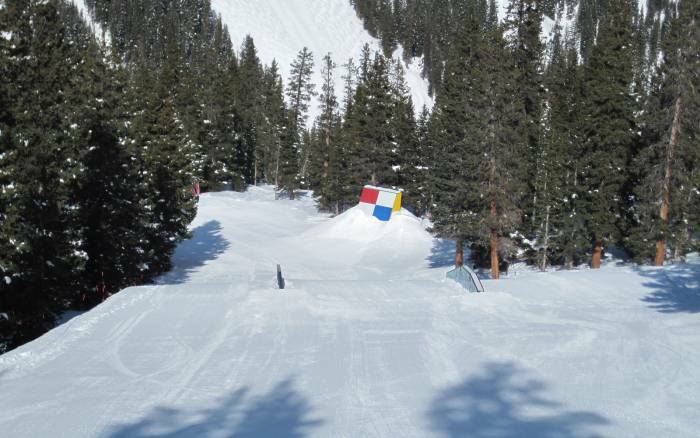 There is a small beginner terrain park located at the Loveland Basin beginner skiing area. This park has a few small slide boxes that are suitable for small children.